Have only a few days in Iceland? Our favorite road trip in all of Iceland is the stretch from Reykjavik through southern Iceland ending at Jökulsárlón Glacier Lagoon and Diamond Beach. We would pick the drive along the southern Ring Road over the Golden Circle over and over again. The drive itself is magical and there are a ton of cool sights to see along the way. You'll see waterfalls, glaciers, beaches, lagoons and lava fields within the span of only a few hours. We recommend taking 2-3 days to drive round trip from Reykjavík to Jökulsárlón. The drive itself is really easy if you have decent weather – you just stay on one road the entire time and follow the signs to attractions. One thing to keep in mind is there aren't a ton of food and drinks options along the way, so we recommend packing enough drinks and snacks to get you through the days and eating at your hotel's restaurant for dinner. Use our table of contents below to see our favorite sleep options and experiences in South Iceland. A downloadable & printable itinerary. Where to sleep, eat and play. Clickable Google Maps for easy navigation. Click here to download your Iceland itinerary now. If you decide to drive through South Iceland, you’ll want to stay over at least one night since it’s too long to go from Reykjavík and back in one day. These are our two favorite hotels along the southern Ring Road. We unfortunately didn’t get to stay here since the hotel is small and all the rooms were booked by the time we were in planning mode, but we were lucky to stay it's sister hotel Ion City Hotel in Reykjavik. That said, we stopped by the hotel on our drive through South Iceland and it is stunning. Ion Luxury Hotel is a true design hotel with thought put into every detail. They also have a fabulous restaurant on site. We suggest spending at least a night here during your stay in Iceland. Since it’s located in Selfoss and away from the light pollution in Reykjavík, you have a pretty good chance of seeing the northern lights if the conditions are right. Prices start at $280/night. Book here. This was one of our favorite hotels during our Iceland trip. The Fosshotel Glacier Lagoon recently opened in summer 2016 and is located right off of the Ring Road about 20 minutes before you get to Jökulsárlón Glacier Lagoon. The hotel has minimalist rooms with large windows overlooking the Icelandic countryside and sea. It’s a great spot to watch the northern lights from the cozy indoors if you’re lucky enough to be there when they make their debut. The beds are really cozy with Geysir wool blankets at the foot. One thing to note is that the hotel restaurant is pretty pricey and your only option – be prepared to drop $50-75 per person. That said, a really awesome breakfast spread is included in your stay, so it all kind of evens out. Prices start at $165/night. Icelandic farms – you’ll drive past Icelandic farms for miles between Selfoss and Vík, many of which have friendly Icelandic horses (much smaller than normal horses) grazing along the side of the road. Pull over so you can get out and pet them. Seljalandsfoss – Foss means waterfall in Icelandic and Seljalandsfoss is one of the coolest waterfalls you’ll find here (trust us, they are plentiful). You can climb up behind the waterfall into a small cave for a unique view (if you don’t mind getting wet). The mountain behind the waterfall is Eyjafjallajökull – the volcano that famously erupted in 2010. Skógafoss – Another cool waterfall just down the road from Seljalandsfoss. The water is super powerful and you can climb up the side of the mountain to get to the mouth of the waterfall. Legend has it that a Viking settler hid a treasure chest behind the waterfall (no one has found it yet). Dyrhólaey – as you approach the town of Vík, you’ll see a turn off for Dyrhólaey, a peninsula with breathtaking sea and landscape views. We spent an hour here hiking around and exploring the wildlife. Reynisfjara – not far from Dyrhólaey is Reynisfjara, a black sand beach with really impressive rock structures jetting out from the cliff. We almost missed the warning sign, but be careful getting too close to the water here – large waves are said to sneak up on people and several tourists have died being swept out by the current (eek.). Vík – A cute little town that marks the halfway point on this drive to Jökulsárlón Glacier Lagoon. Take a breather here to stretch your legs, grab a snack and fill up your car with gas. There’s not much in terms of infrastructure between here and Jökulsárlón so make sure to get the essentials covered in Vík. Eldhraun lava field – As you leave Vík you’ll come cross a massive stretch of land that appears to be giant boulders covered in thick, bright green moss. It is actually a giant lava field created by the 1783 Laki eruption – one of the largest volcanic eruptions ever. It’s said NASA’s Apollo 11 crew came to the site to train for their moonwalk. Pull over on the side of the road and get out to explore. We could have spent hours here. Skaftafell – To visit the lagoon, you drive through a portion of Iceland's (and Europe’s) largest national park, Vatnajökull. It’s absolutely stunning. You’ll want to pull over on the side of the road every few miles for views of massive glaciers, snow capped mountains and apocalyptic-like valleys. Skaftafell is located at the foot of Vatnajökull glacier, the biggest glacier outside of the north and south poles. From here you can take glacier hiking and ice caving tours. Jökulsárlón Glacier Lagoon & Diamond Beach – Jökulsárlón is a glacial lagoon at the edge of Vatnajökull National Park. This was the highlight of our trip and one of the coolest places we’ve ever been on this earth. It’s worth the entire drive from Reykjavík. The lagoon is filled with giant floating icebergs with a backdrop of towering mountains. From the lagoon, water and icebergs flow into the Atlantic Ocean. The black sand beach at the mouth of the lagoon is called Diamond beach because it’s covered with giant blue icebergs scattered all over the beach. Look for seals while you’re exploring – they’re known to rest on the icebergs. Since we only had 5 days in Iceland and we prioritized spending time in Reykjavík and driving the southern Ring Road, we actually skipped the Golden Circle (gasp). If you have 6 or more days in Iceland, we recommend giving it a whirl since you can do it as a long day trip from Reykjavík. The Golden Circle is basically a loop drive where you start and end in Reykjavík. 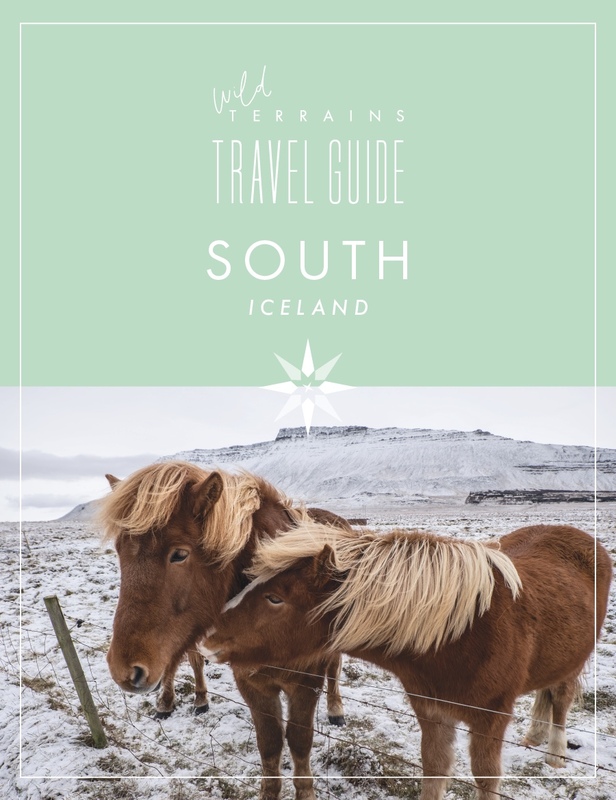 The stops we recommend are: Þingvellir National Park, Laugarvatn Fontana Geothermal Baths, Efsti-dalur (a farm hotel with an ice cream shop in the summer months), Geysir, Strokkur, Gullfoss, Secret Lagoon in Flúðir, Kerið volcanic lake, and the Icelandic Horse Park in Fákasel.